There is a considerable evidence base for 'collaborative care' as a method to improve quality of care for depression, but an acknowledged gap between efficacy and implementation. This study utilises the Normalisation Process Model (NPM) to inform the process of implementation of collaborative care in both a future full-scale trial, and the wider health economy. Application of the NPM to qualitative data collected in both focus groups and one-to-one interviews before and after an exploratory randomised controlled trial of a collaborative model of care for depression. Findings are presented as they relate to the four factors of the NPM (interactional workability, relational integration, skill-set workability, and contextual integration) and a number of necessary tasks are identified. Using the model, it was possible to observe that predictions about necessary work to implement collaborative care that could be made from analysis of the pre-trial data relating to the four different factors of the NPM were indeed borne out in the post-trial data. However, additional insights were gained from the post-trial interview participants who, unlike those interviewed before the trial, had direct experience of a novel intervention. The professional freedom enjoyed by more senior mental health workers may work both for and against normalisation of collaborative care as those who wish to adopt new ways of working have the freedom to change their practice but are not obliged to do so. The NPM provides a useful structure for both guiding and analysing the process by which an intervention is optimized for testing in a larger scale trial or for subsequent full-scale implementation. A multi-professional approach to patient care: This requires that a general practitioner (GP) or family physician and at least one other health professional (e.g., nurse, psychologist, psychiatrist, pharmacist) are involved with patient care. A structured management plan: in the form of guidelines or protocols: Interventions may include both pharmacological (e.g., antidepressant medication) and non-pharmacological interventions (e.g., patient screening, patient and provider education, counselling, cognitive behaviour therapy). Scheduled patient follow-up: An organised approach to patient follow-up by systematically contacting patients to provide specific interventions, facilitate treatment adherence, or monitor symptoms or adverse effects. Enhanced inter-professional communication: By introducing mechanisms to facilitate communication between professionals caring for the depressed person. This might include team meetings, case conferences, individual consultation/supervision, shared medical records, patient-specific written or verbal feedback between caregivers. In the United Kingdom (UK) the Medical Research Council (MRC) guideline for the evaluation of complex interventions provided a phased methodological framework  highlighting the need for evaluation of process, which is essential for understanding the problems of integration of interventions into healthcare settings. Application of the framework suggested exploration of barriers and facilitators to implementation, which is an approach that has now been extensively used to understand the difficulties in implementation of collaborative care in the United States (US) [6–9]. However, the methodology used in these analyses has also been largely pragmatic, with only limited use of theoretical models to either interpret their findings or develop hypotheses for future research. The revised MRC Framework published in 2007  emphasized the iterative nature of the tasks of defining and understanding the problem and its context, developing and optimizing and then evaluating the intervention, rather than viewing these as distinct conceptual stages. The utility of theoretical models drawing on health psychology (if the problem to be tackled is individuals' health behaviour) or social and organisational theory (to understand health service and practitioner factors) was specifically highlighted in this iteration of the framework, however the process by which an intervention is optimized for testing in a larger scale trial or for subsequent wide scale implementation remains ad hoc, with no clear framework to guide the researcher or future service developer. Recently, May  proposed that the Normalization Process Model (NPM--see Table 1) provides a theoretical framework for understanding the workability (capable of being put into operation) and integration (assimilation into practice) of a complex intervention and demonstrated how this can used to understand trial outcomes . Normalisation is concerned with the routine embedding of a classification, artefact, technique, or organisation practice in everyday work, and the NPM is specifically concerned with the work that people do to make a complex intervention work in everyday practice. It is therefore complementary to diffusion theory [13, 14], which is concerned with the diffusion of innovation across networks, and psychological theories [15, 16] that are concerned with intention and individual behaviour that might dispose professionals to adopt an intervention. May and colleagues have suggested that the NPM might be used to assess the normalization potential of a working practice (see table 1). (i) Interactional workability: This refers to how work is enacted by the people doing it. A complex intervention will affect co-operative interaction over work (congruence), and the normal pattern of outcomes of this work (disposal). How does collaborative care for depression (CCD) impact on basic communication, clinical care and treatment at the level of patient and professional? (ii) Relational integration: This refers to how work is understood within the networks of people around it. A complex intervention will affect not only the knowledge required by its users (accountability), but also the ways that they understand the actions of people around them (confidence). How does CCD impact on the way that health professionals relate to each other? Does it seem to be the right thing to be doing? It is perceived as valid and/or useful? Who needs to be involved in the work? How do we inform them and link with them? (iii) Skill-set workability: This refers to the place of work in a division of labor. A complex intervention will affect the ways that work is defined and distributed (allocation), and the ways in which it is undertaken and evaluated (performance). Does this mean health professionals learning new skills or doing things differently? Is there a person available with the right set of skills to implement CCD? Does CCD challenge professional autonomy over working practices? Does it impact on case load and allocation of work? Who has the power to make CCD happen? Does the system want it to happen? How can we divert resources to it? As part of an exploratory trial of collaborative care for depression in a UK setting [17–19], we carried out a process evaluation to explore how the intervention might be adapted and made to work optimally in practice. The study team undertook a Phase II patient-level randomized controlled trial in primary care , nested within a cluster-randomized trial (this was in order to determine whether cluster- or patient-randomization would be the most appropriate design for a Phase III clinical trial--see Figure 1). The trial used an innovative design to determine the existence of contamination, as well as the effect of the collaborative care intervention. Collaborative care includes a component that impacts on the individual patient (e.g., medication management from the case manager) and a component that impacts on the professionals and the practice (e.g., feedback of patient information to the GP, changes in practice organisation). 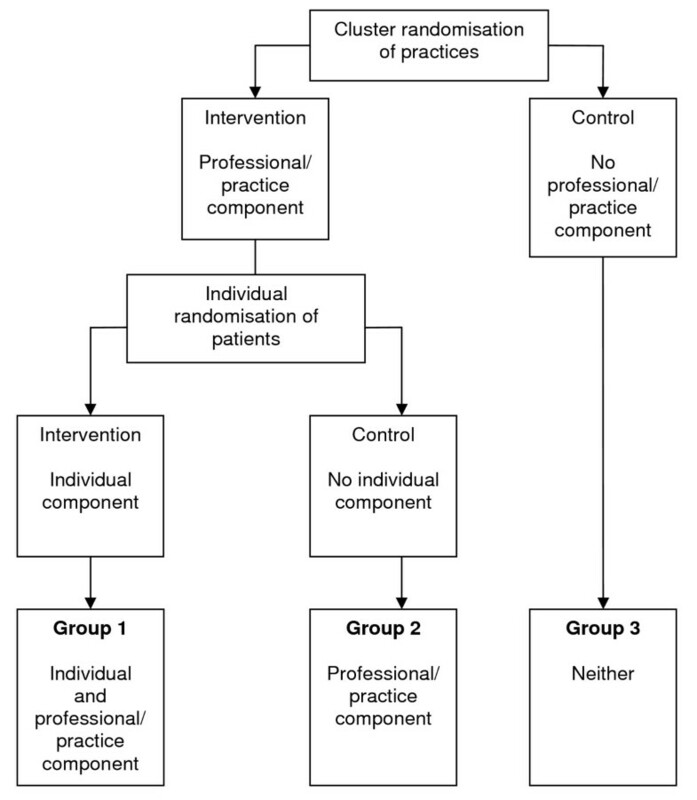 In a standard, individually randomised trial, the component that impacts on the professional and the practice can lead to contamination, because it may influence patients in the control group. This trial used an individually randomised trial nested within a cluster trial. The design enables an analysis of the effect of the whole collaborative care intervention (through a comparison of group one and group three), and an analysis of any potential contamination (through a comparison of group two and group three). Depressed participants were randomized to 'collaborative care'--case manager-coordinated medication support and brief psychological treatment, enhanced specialist and GP communication--or a usual care control. The primary outcome was severity of depression (PHQ-9 ). In all, 114 participants were recruited, 41 to the intervention group, 38 to the patient randomized control group, and 35 to the cluster-randomized control group. For the intervention compared to the cluster control, the PHQ-9 effect size was 0.63 (95% CI 0.18 to 1.07). There was evidence of substantial contamination between intervention and patient-randomized control participants, with less difference between the intervention group and patient-randomized control group (-2.99, 95% CI -7.56 to 1.58, p = 0.186) than between the intervention and cluster-randomized control group (-4.64, 95% CI -7.93 to -1.35, p = 0.008). From this 'trial platform' study, we aimed to develop a larger scale phase IV clinical multi-centred trial (which, given the results reported above, would subsequently require to be a cluster randomised design). We recognised early in the conception of the project that a considerable amount of work would be required to optimize an intervention originally designed in the US for a British setting, and we thus aimed to collect extensive qualitative data at different stages of the process. In this paper, we will apply the NPM to our process data in order to consider what we can learn about the additional or 'hidden' work (i.e., that which is not immediately apparent at conception of the project or not usually included in publication of results of a trial) that needs to be done to make a collaborative care intervention for depression in primary care both workable and integrated into routine practice in both our forthcoming full-scale trial of collaborative care for depression in the UK and the wider healthcare settings following the trial. In initiating this task, we were particularly interested in the value of application of the NPM to process data in order to aid us in further development and evaluation of this intervention in the UK. This is a novel approach which has not, to our knowledge, yet been widely adopted for use at different stages in the formal analysis of a complex intervention to inform further iterations of the research process, even though it was originally intended for purpose . 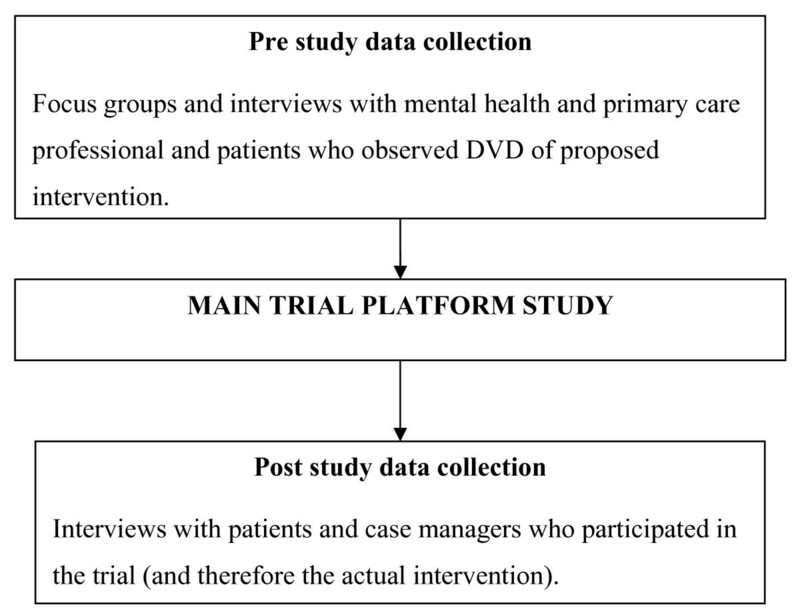 Application of the NPM to data collected in both focus groups and one-to-one interviews with both practitioners and patients before and after an exploratory randomised controlled trial of a collaborative model of care for depression (see Figure 2). We utilized the data to both understand and identify the 'hidden work' essential to optimizing the intervention not apparent at the conceptualisation and design stage of the intervention and make predictions about future issues in implementation. Key questions (see table 1) relevant to the specific intervention were derived from the four factors of the NPM by the lead author, who had previous of experience of working with the NPM and discussed with the wider research team. They were considered to be highly relevant to the requirements of the study and no further iterations were required. We considered that data collected before the trial would enable us to test out the predictive value of the NPM in terms of what actually happened in the trial platform, and the data collected after the trial would be of particular value in revising the content of the intervention in terms of both the forthcoming large scale trial and wider dissemination. The detailed description of protocol development can be found elsewhere . We identified key prototype collaborative care components using a systematic review and meta-regression . We used qualitative methods to provide a contextualized picture of the views of key stakeholders on the acceptability, feasibility, and barriers to collaborative care for depression in the UK. A convenience sample of stakeholders was recruited from primary care organizations (PCOs) in the north of the UK. Primary Care Physicians (PCPs) and practice nurses were recruited from practices in PCOs that had agreed to participate in the trial. Other participants were recruited from teams and specialist care providers that provided primary and secondary mental healthcare to the PCOs. Patients were recruited by four participating PCPs who each mailed a letter to 20 of their patients who were receiving treatment for depression in primary care. No participants had had any experience of this method of organizing care and none been involved in the trial design. We interviewed 49 participants. All 38 professionals who were asked to participate in the study agreed to do so: 12 PCPs, four psychiatrists, four clinical psychologists, four practice nurses and 14 mental health workers (seven mental health nurses, two counsellors, three graduate mental health workers, one social worker, and one unqualified support worker). We had planned to conduct focus groups with all respondents, but to arrange mutually convenient times for separate groups of GPs, professionals, and patients proved to be impossible. Therefore, most interviews were conducted individually apart from two focus groups with 11 of the 14 mental health staff. From the 80 letters posted to patients, 17 consented to participate of which 11 were interviewed, five subsequently declined or could not be contacted, and one became so distressed that the interview was abandoned on ethical grounds and the patient was encouraged to contact the PCP. We had earlier filmed four role-plays, representing those key clinical features of collaborative care that could be represented on film. These included the necessity for brevity of contact in this therapeutic approach (not hour-long sessions); use of telephone consultations; the need for a patient-centered, collaborative approach to care, problem-focused interviewing style; information giving; the skills of medication management and behavioural activation (BA)--an evidence-based psychological treatment for depression , which has been used in the low-intensity manner required for short patient contacts in collaborative care. Participants were sent a copy of this videotape/DVD to view prior to their interview. Interviews and focus groups were structured using an identical topic guide. Although topic areas were similar for patients and professionals, questions to patients focused on their views about potential receipt of the intervention, whereas questions to professionals focused on delivering it. The interviews lasted approximately 30 to 40 minutes, while the focus group activity lasted 1 to 1.5 hours. We carried out a further round of one-to-one interviews with case managers and patients who have received the intervention..
All of the eight case managers from the trial--five graduate mental health workers, one counsellor, two mental health nurses(who had both participated in the pre-trial focus groups)--and 13 of the patients who had been in receipt of the intervention were purposively selected for age, gender, and profession of case manager. We were unable to obtain interviews with the PCPs involved in the study due to our resource pressures. Data were collected using semi-structured interviews. Patients were asked what they thought about how the intervention was structured, the relationship with the case manager, what they learned about depression from the intervention, and their views about the different elements of the intervention. They were also asked if contacts with, or attitude to, their PCP had altered as a consequence of their involvement in the trial, and whether their symptoms improved or not as a result of their participation. The detailed findings from the patient interviews are reported elsewhere . Case managers were asked how the study protocol differed from their usual approach to assessment and treatment, whether they had any problems with adapting their style of working at all, either in specific ways or with specific clients. We also explored whether there was anything about the protocol that they found beneficial or difficult, and what was its impact on both professional and patient. We asked how easy or difficult it would be for them to adapt their routine way of working to the Collaborative Care for Depression protocol, and the personal and organisational barriers that might exist. Finally, we requested their views on the written materials and the supervision they had received. Data analysis was led by the lead author. Two sets of data were entered into the analysis: the pre-trial data that was obtained from interviews and focus groups with participants who observed the DVD of role-played examples of the intervention and discussed what 'might' happen in trying to adapt the intervention; and post-trial data with patients and practitioners who enacted the intervention in the trial platform study. LG coded the data utilising a simple template  or a priori coding manual specifically derived from May's original description of the NPM , with specific questions derived from the four factors to address implementation of collaborative care for depression (see table 1). This was then entered onto MAXqda2 qualitative analysis software . A total of 61 transcripts (consisting of 59 individual interviews and two focus groups) were included in the analysis. Only data that could be coded according to the NPM-derived template was considered. The findings were discussed in detail with the trial research team, and underwent subsequent revisions to achieve consensus that they accurately reflected the original data and the lessons to be learned from the study for future implementation. We will present the findings as they relate to the questions derived from the four factors of the NPM. Several of these arose in relation to the factors in the pre-trial interviews and focus groups that we had not previously considered (and thus were 'hidden work' that needed to be considered and carried out to make the study work that not apparent at the time of trial design), and others arose during the study (and were not predicted in the pre-trial interviews and focus groups) and thus were 'hidden' until participants had direct experience of this kind of intervention, and will inform future work. How does collaborative care for depression impact on basic communication, clinical care, and treatment at the level of patient and professional? The tasks that we identified as necessary work to optimise interactional workability for future studies are summarised in appendix 1. How does Collaborative Care impact on the way that health professionals relate to each other? Who needs to be involved? How do we inform them and link with them? We can anecdotally confirm that these did indeed provide to be important. However we were unable to explore these issues in greater depth after the intervention because we did not carry out post-intervention interviews with the PCPs. Does it seem to be the right thing to be doing? Is it perceived as valid and/or useful? future studies are summarised in appendix 2. Does this mean health professionals learning new skills or doing things differently? Is there a person available with the right set of skills to implement Collaborative Care? Does Collaborative Care challenge professional autonomy over working practices? Does it impact on case load and allocation of work? 'If you see the case manager as replacing the CPN, which is how I see it, in a way, then the next person up who we need advice from, is going to be the consultant psychiatrist.' (PCP, before trial). Given the small number of cases managed by each worker in the trial, the impact on workload was difficult to assess. Key issues for skill-set workability in future studies are summarised in appendix 3.
Who has the power to make collaborative care for depression happen? Does the system want it to happen? How can we divert resources to it? We have noted above the flexibility in working practices that experienced mental health professionals enjoy in the National Health Service (NHS) that therefore makes introduction of new working practices potentially both more and less problematic. Our experienced professionals were free to choose to adopt this model of working, but the same professional freedom for mental health workers makes it harder to impose a new working practice across the board. Issues in optimising contextual integration are addressed in appendix 4. The NPM provided us with a neat and conceptually rich framework to guide analysis and our thinking about a range of key issues in the implementation of collaborative care for depression in both research trials and routine practice. It provided a novel way of evaluating and interpreting process data that added value to the analysis. Using the model, it was possible to observe that certain predictions about work that would need to be done that could be made from analysis of the pre-trial data relating to the four different factors of the NPM were borne out in the post-trial data. This work was important in our detailed preparation for the trial, although we were still not able to characterise exactly what it involved until completing the trial platform study. Additionally, it may be difficult to predict exactly what work is involved if participants have no experience of a novel intervention, thus we gained some particular insights from post-trial data. In our experience, the importance of doing this work in the preparation for a trial, in order to make a novel intervention work in the setting of a study, is rarely reported with the findings of the trial, and thus this work remains hidden. In our large scale, MRC-funded trial of collaborative care for depression , we have learned that it will be essential to address a number of key issues in the preparation of both case managers and supervisors. These include how to engage the patient and explain both the systematic nature of the approach to care (particularly the regular assessment of severity using the PHQ-9) and the time-limited nature of the intervention. There is also a need to address the acquisition of the skills required for telephone working. Clear protocols have been agreed for liaison between professionals and the issue of how to deal with co-morbidities (such as anxiety disorders) has been explicitly addressed. The implementation of collaborative care models in the setting of the NHS means that existing relationships, received wisdom about ways of working, and professional roles are challenged, and the organisational tasks required for implementation are considerable but by no means insurmountable. Our findings under the heading of 'contextual integration' will be of particular relevance here. The professional freedom enjoyed by more senior mental health workers in the NHS may work both for and against normalisation of collaborative care as those who wish to adopt new ways of working have the freedom to do so but are not obliged to do so. Our failure to interview PCPs after the intervention had been delivered was undoubtedly a weakness of the present study. However, we collected a considerable number of interviews in both phases of data collection, and the post-intervention data was not collected from one but four different Primary Care Trusts in the North of England. Nevertheless, we are aware that our participants who were essentially a convenience sample may have been biased, and more open to considering change in practice from more routine and familiar styles of care. We are also aware that we may not have asked all of the important questions of the data, and other researchers may have derived a wider range of questions from application of the four factors of the NPM to this study. This is something that we will revisit in future studies utilizing the model. Additionally, we have not addressed in this research the range of complex issues involved in bringing about organisational change in healthcare, only what needs to be done . Future research might utilise the NPM in addressing the work that is required to implement collaborative care on a much larger scale into a routine healthcare setting, using results of this study in the development of hypotheses that can be tested in the full-scale trial. The NPM provides a useful structure for both guiding and analysing the process by which an intervention is optimized for testing in a larger scale trial or for subsequent wide-scale implementation. Using this framework, we have developed what we hope will be useful guidance for those already implementing collaborative care models, both in the UK, (as part of the Improving Access to Psychological Therapies initiative being led by the Department of Health ) and internationally, as it focuses not simply on what are the barriers but what has to be done in practice to make an intervention really work. Explanation of the systematic nature of approach to care. Alliance building- easier if first assessment is face-to-face. Explaining the use of the structured approach to assessment of severity. Specific communication and confidentiality issues raised by telephone working. Postal preparation for the telephone session. Negotiation of difficult issues raised by ending. Dealing with ambivalence and potential for dependence. Clarity of arrangements for liaison between patient, PCP, and case manager. Adjusting the depression focus of the protocol in research practice to the reality of co-morbidity issues in primary care practice. Particularly an issue for wider implementation. Not only developing the evidence base but educating other key professionals in the wider network about the evidence base for collaborative care. Recognition within organisations that there is a workforce that is being specifically trained for this task. Opportunities for other workers to train in these skills if they wish to. Development of comprehensive working protocols to manage risks. Appropriate supervision and liaison arrangements. Management practice within the organisation- to facilitate new ways of working. Leadership within the local health economy. Developing the business case by policy leaders and managers. LG conceived and lead the analysis and drafted the paper. DA, JA, AL, and AS carried out the interviews and focus groups. All of the authors contributed to the discussion and interpretation of the findings from the analysis and commented on the paper. DR was the Chief Investigator and grant-holder for the trial. All authors have read and approved the final manuscript.